Since I began photographing weddings professionally the popularity of Asian pre wedding photography shoots has increased enormously. So now a pre-wedding photo shoot for the couples getting married has become standard and is included part of my wedding photography package. 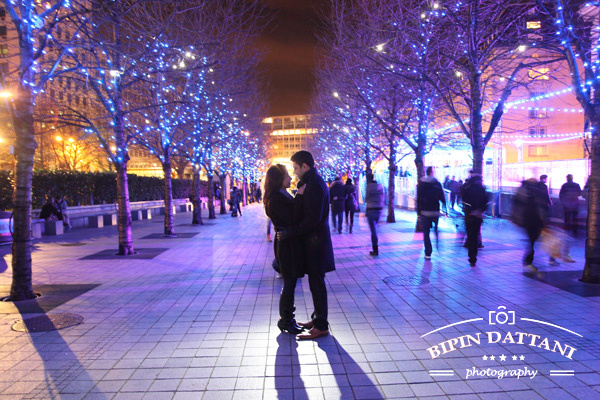 This gives me a chance to capture the images in a creative fashion style, still being in mind that to make the pictures look natural as most couples now want. Also the couple will be more relaxed which helps to create standout pictures. 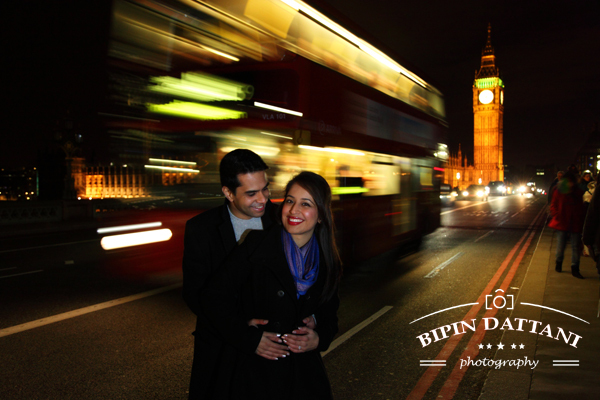 Being based in London, I am fortunate that I have London’s stunning skyline and many of the popular tourist locations on my doorstep to use at backdrops. Mostly we organise the shoot in advance and hope for a good dry day, however once in a while I get unusual requests. 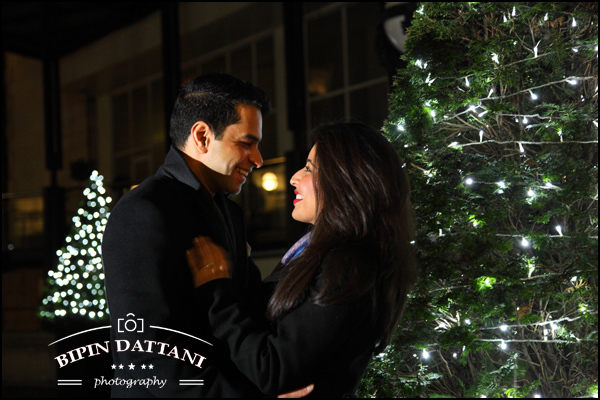 Chandni & Saagar wanted two shoots, a night engagement portrait shoot in London and a day time pre-wedding photography session in the countryside which you can see here. 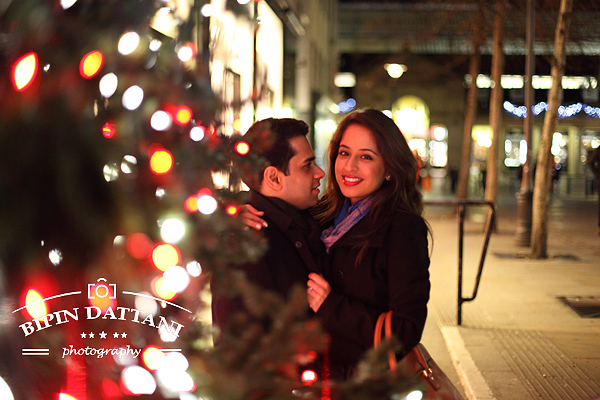 We had arranged the night photography session just after Christmas time so we could capture the light decorations and the Christmas tree too. On the pre arranged day, having put on my thermals and warm cloths on a very cold winters evening we drove into Central London, starting at The London Eye and Houses Of Parliament area, followed by Regents Street and finally Covent Garden. The shoot was arranged on this day as it would get dark early so we would not have to wait for the light to start glowing and hoping that there would be less people. How wrong we were, the area around The London Eye and Big Ben was very busy with tourist from all over the world, from the different languages they were speaking. They had come to London in Winter! Yes, we all got very cold and will the couple still remember this night shoot? At the start of the session I thought they were brave as both took off their winter costs for the pictures but the soon realised it was cold, in fact Chandni even put on her Uggs near the end. I knew that I was creating great images for them and with a little bit of post processing in Photoshop, that their photographs would be Amazing. I personally think it was well worth it and I am certain they will cherish these pictures for a long time.